KREATIVEassassin: Yay! Found an NES game I needed! Yay! Found an NES game I needed! It's a rare occurrence for me to find an NES game I need. By need, I mean one I don't already own. Today I found something! Quick blog time. I need 63 licensed NES games before I own them all. I have never bought anything from eBay; the bulk of these games have come from local pawn shops. I know very well what I have, and when I see something I don't own, it really sticks out to me. I have never accidentally bought a game I already own. Each duplicate I have is one I deliberately picked up. So today I visited the pawn shop like I do every Saturday. I never go into a place thinking I'm going to find anything I need. Typically, my rule is that if I have to put my keys away to rummage through carts, it's a worthwhile trip. Putting my keys away means that there are new games there that I haven't looked through before. When I walked in today, I saw a huge truck bed toolbox laying on the ground in front of the games. It annoyed me that they put it there in the way, and I was about ready to just ignore the games completely because it's been so long since they had new stock in, but I saw a copy of Predator there that wasn't there the week before. Ah! They got some new games in! So I put my keys away, crouched down, and began thumbing through the titles. I have a habit of rescuing games from pawn shops if they're good or mean something to me. So when I saw among the pile of games a copy of Double Dragon and R.C. Pro-Am, I snatched them up. I figured if anything I could clean them up and take them to work one day if I ever have an NES there in the breakroom. Then I saw a game that jumped out at me as one I didn't have. Picking it up and looking at the label, I confirmed my suspicion: For the first time in 2013, I found an NES game I didn't own. 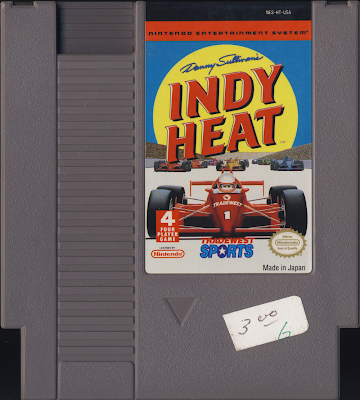 Danny Sullivan's Indy Heat! Not that this is a particularly exciting game for normal people to find. It's not like I stumbled upon a copy of Stadium Events or even Dragon Warrior 4. 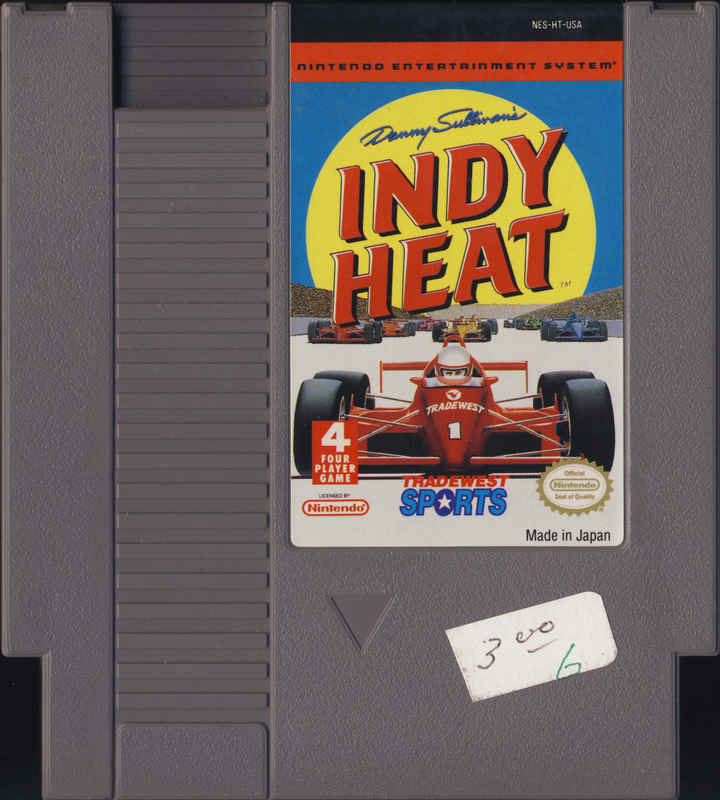 This is Indy Heat. It's a game probably anyone would look over, but for me as someone that needs less than a hundred licensed titles before I have them all, it's an absolute treasure! Feels good to mark a game off of my needed NES games list. Maybe I'll find another game I need by the end of the year! So I bought three NES games and a Super Nintendo game I need the shell for for a total of $10. After I got home, I discovered that the other two games I bought, Double Dragon and R.C. Pro-Am, actually had different seals of quality on them from the ones I already had. Turns out I found three games I needed today and not just one! Dodgson! We've got Dodgson here! See, nobody cares.